Regular Closures: Mondays, Easter Sunday, Christmas Eve to Boxing Day, New Year’s Day. As one of the most iconic sporting locations in the world, Twickenham Stadium is an absolute must-visit for any rugby fan. Home to the world’s best collection of rugby memorabilia, the World Rugby Museum takes you on a journey through the sport’s history with fascinating exhibitions and immersive experiences. An exclusive look behind the scenes at the world’s most famous rugby stadium. Take a seat in the England dressing room; soak up the atmosphere in the Royal Box and imagine the roar of the crowd as you run out of the players’ tunnel. Led by an informative guide throughout your tour, you will get to explore the sights of the pitch from the Royal Box, visit the hospitality suites and the medical room and discover interesting stories and facts as you go. 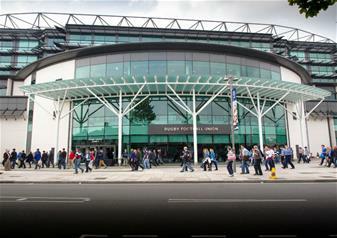 Formally opened as the Museum of Rugby in 1996, it became the World Rugby Museum in 2007 and was refurbished in 2013. Explore the five museum zones and learn about the history of rugby union - The Spirit of Rugby, Rugby’s Story, Play Rugby, Rugby Moments and the special exhibition area.